FAQ | ECIR Group, Inc.
ACTH: Adrenocorticotrophic Hormone. A hormone produced by the pituitary gland that triggers production of cortisol from the adrenal gland. Also the name of the single-draw blood test (endogenous ACTH) used to diagnose PPID/Cushing's disease. Chaste Tree Berry (Vitex agnus-castus) or CTB. An herb with some of the same effects as the drug pergolide, which may control PPID/Cushing's disease symptoms in some horses. Most horses, however, will need to be placed on the drug pergolide for effective control. What is the Correct Hay or Feed for My IR or PPID Horse? Grass hay with a tested Ethanol Soluble Carbohydrate (ESC) + Starch below 10%. Any bagged feed should have a combined ESC + Starch below 10%, with the Starch portion below 4%. What are Safe Feeds to Use as Carriers for Feeding Supplemental Minerals, Salt, and Flax? Properly rinsed and soaked beet pulp with no molasses added is best. Soybean hulls and Brewer's Dried Grains are also acceptable. If a brand-name feed, it must guarantee ESC + Starch below 10%, preferably with Starch less than 4%. Just because a manufacturer says it is "safe" or "low" doesn't mean it is. Also check the ingredients list for alfalfa, as some IR horses are sensitive to it. Cortisol: A hormone produced by the adrenal gland that is released naturally during times of stress (e.g., excitement, transport, exercise, infections, trauma, pain, fear). When production is abnormally high and sustained, it can result in impaired immune function, resistance to insulin, electrolyte abnormalities, and impaired ability to utilize protein in the diet. In the horse, what is commonly called Cushing's Disease is caused by hyperplasia (enlargement) or adenoma (benign tumor) in a portion of the pituitary called the pars intermedia (intermediate lobe). Therefore, to be more accurate in describing it, the term PPID — Pituitary Pars Intermedia Dysfunction — is really the correct term. This disorder of the pituitary gland results in hormonal disturbances by secreting high levels of the hormone ACTH, which stimulates the production of cortisol, a stress hormone. This is generally considered a disease of middle-aged or geriatric equines. What is DDT + E? DDT + E: Acronym for Diagnosis, Diet, Trim and Exercise. All must be addressed together for a successful recovery/rehabilitation. What is the Emergency Diet? ALL horses, regardless of diagnosis, need to be fed 1.5 - 2.0% of body weight. For horses that need to lose weight, feed 1.5% of the horse's current body weight or 2.0% of the horse's ideal body weight — whichever is more. NOTE: Starvation diets to address obesity by providing small amounts of poor-quality hay have been universally unsuccessful for the IR horse and will actually worsen Insulin Resistance! Why is Fasting not Recommended Before Blood Work? The goal of testing is to see how the horse's insulin responds to what he or she is eating. Horses that have been fasted (nothing to eat from the time of the previous evening's feeding until after drawing blood the next morning) will have a lower insulin than if they had continued access to hay. Horses that are fed meals will have an exaggerated insulin spike after the meal and therefore have a higher insulin than if they had free access to hay continually. Horses that have access to hay via slow feeders will not have an exaggerated insulin spike or an abnormally low insulin. Why is Free-Choice Feeding not Recommended? It has been suggested that horses with IR must have unlimited access to hay and that even a few minutes without hay is dangerous to them. The rationale is that being deprived of access to food is unnatural and constitutes a stress, causing cortisol release. The cortisol release in turn will worsen or perpetuate IR. A further claim is that this stress and cortisol release will lead to acute, chronic, or recurrent laminitis. This is dangerous advice that has no basis in fact and attempts to simplify what is not a simple situation. The most important consideration with regard to hay, IR and laminitis risk are the Ethanol Soluble Carbohydrates (ESC) and Starch content of the hay. Whether fed in limited amounts or free choice, this is what determines the insulin response and therefore how safe (or not) that hay is. Fructan is a storage form of carbohydrate in plants, made up of very long chains of fructose. Although fructose is a sugar, fructan is not. Mammals do not have the enzymes necessary to break apart the bonds in fructans; fructans are essentially food for the bacteria that live in the gut. While it is true that a really enormous overdose of fructan (such as a large amount of chicory root inulin administered by stomach tube) will cause laminitis, the mechanism for this is hind-gut overload, bacterial die-off, and the subsequent endotoxemia that results. These horses have explosive diarrhea, fever, and are very ill.
Fructans will not cause a rise in insulin. Normal intake of fructan from hay or pasture will not cause laminitis. Simple sugars (ESC) and Starch will cause hyperinsulinemia in IR horses. 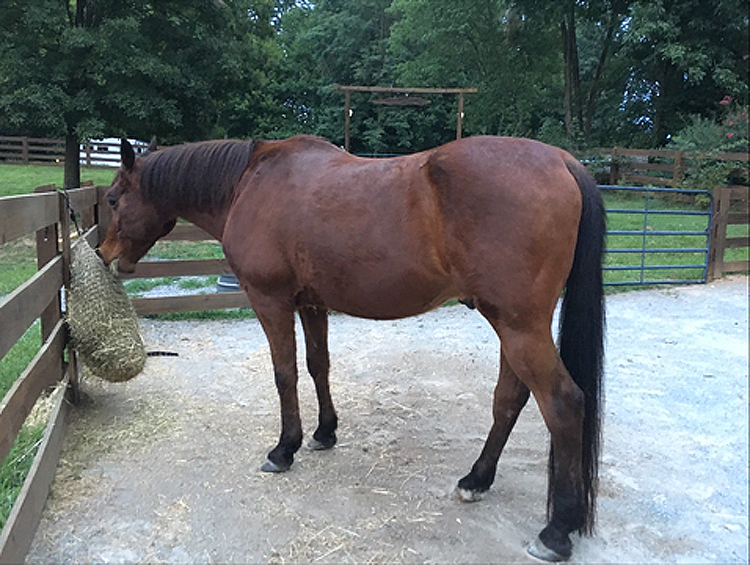 High insulin is what causes laminitis in these cases. The vast majority of laminitis is caused by endocrine disorders (PPID and IR) that raise insulin above normal. For more information see DIET — Nutritional Needs for Insulin Resistant and PPID/Cushing's Horses and Treatment of Insulin Resistance. What is the G:I Ratio? The Glucose to Insulin Ratio (G:I ratio) is a very simple concept. This ratio/number indicates how many "units" of insulin are being secreted per "unit" of glucose. The smaller the number, the less sensitive the cells are to insulin. For example, a normal horse may have a blood sugar of 100 and an insulin of 10, for a GI ratio of 100/10 = 10:1, while an insulin-resistant horse may have an insulin of 25 for that same blood sugar of 100, yielding a G:I ratio of 100/25 = 4:1. Both insulins may be within the laboratory's "normal range", but those normals represent a variety of diets and various times after eating. Obviously, the horse that has a circulating insulin level 250% higher than another horse with the same blood sugar level is less sensitive to insulin. A ratio < 4.5:1 is diagnostic for Insulin Resistance, while a ratio between 4.5:1 and 10:1 represents compensated IR. What is the IR Calculator? The IR Calculator is the tool designed to calculate the G:I Ratio, RISQI and MIRG. See IR Calculator. Insulin Resistance (IR) is a condition where cells do not respond to insulin, the hormone primarily responsible for transporting glucose into the cells. It is sometimes also referred to as Insulin Dysregulation, Equine Metabolic Syndrome or the earlier terms Pre-Cushing's or Cushingoid. These can complicate obtaining a correct diagnosis. While IR often occurs in the horse with PPID/Cushing's Disease, it is a distinctly separate condition from PPID and it can occur without PPID. What is Lab Normal? Why does the lab or the vet say the insulin level is normal, when the IR calculator shows the horse as severely IR? 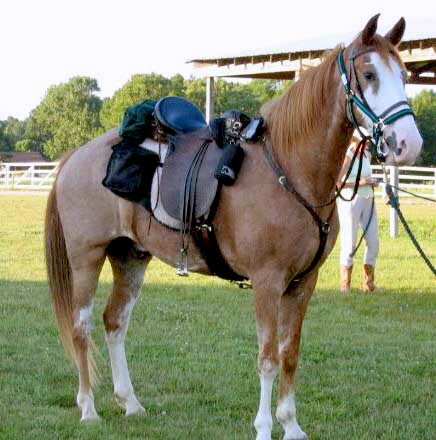 Lab normals are developed from many samples of horses that are assumed to be normal, under all feeding circumstances. The reference ranges, therefore, include everything from a horse that hasn't eaten in 12 hours, to a horse that has just had a big grain meal. The normal insulin for a hay-fed, non-IR horse is much lower than that for a horse that has just had a grain meal. For a horse that has had only low-ESC and Starch hay prior to a blood draw, an insulin within the reference range, but above 10, indicates IR. How do I Interpret Lab Results for Insulin and Glucose? Go here: IR Calculator and plug in your lab results. These calculations were developed by a very elegant study by the Virginia Polytechnic Institute, and can accurately assess laminitis risk. See background on the development of proxies and why they are important: Diagnosis of PPID and IR. What is the Difference Between Laminitis and Founder? 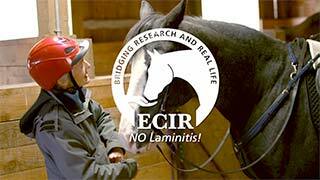 Laminitis: Inflammation of the laminae — the tissues that connect the coffin bone to the hoof wall inside the foot. Often the first sign of PPID/Cushing's or IR is laminitis. Founder: Often used synonymously with laminitis. Most people use the term founder to indicate a horse whose coffin bone has come loose from its hoof wall attachments and is displaced. What is Pergolide? What is Prascend? Pergolide (pergolide mesylate): A dopamine-agonist medication, available by veterinarian prescription and dispensed by a compounding pharmacy; pergolide is considered the gold standard of treatment to control the symptoms of PPID/Cushing's disease. Derived from a natural class of compounds, pergolide mesylate is the active ingredient in Prascend. As described above, pergolide mesylate is also available in compounded form. See also Treatment of PPID and What is Pergolide? Pituitary Pars Intermedia Dysfunction (PPID): In the horse, what is commonly called Cushing's Disease is caused by hyperplasia (enlargement) or adenoma (benign tumor) in a portion of the pituitary called the pars intermedia (intermediate lobe). What is the Difference Between PPID and IR? Pituitary Pars Intermedia Dysfunction (PPID) is a disease that is controlled via medication. Insulin Resistance (IR), sometimes called Insulin Dysregulation, is not a disease per se, but a metabolic type that must be managed, most often through diet. 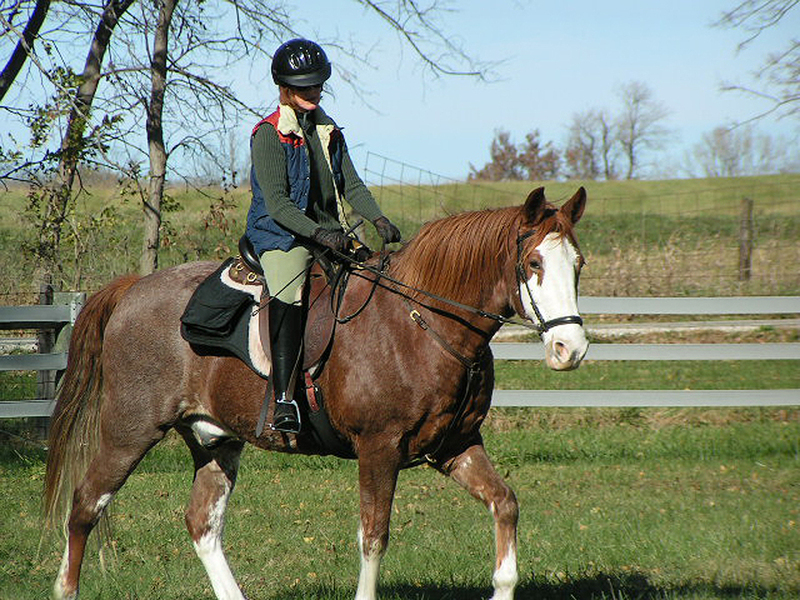 Horses diagnosed as PPID may also be IR. In these cases, PPID must be controlled via medication to not further increase insulin. IR will again be managed by diet. What is the Seasonal Rise? Should I Test My Horse During the Seasonal Rise? Vitex: see Chaste Tree Berry. Sold under the brand name Evitex (formerly Hormonise) in the US; available as Hormonise in the UK. This is the liquid extracted from Chaste Tree Berries. What are WSC, NSC, and ESC? These are terms for various carbohydrate fractions in forage or feeds. Water Soluble Carbohydrates (WSC) are carbohydrates solubilized and extracted in water. Includes monosaccharides, disaccharides and some polysaccharides — mainly fructan. Fructan is a major storage carbohydrate in grasses. Non-Structural Carbohydrate (NSC) is calculated by adding Water Soluble Carbohydrate (WSC) and Starch. Ethanol Soluble Carbohydrates (ESC) are simple sugars. Only ESC and Starch will cause glucose spikes and insulin spikes.